Since I do not work in a typical work environment, I’ve always been curious as to what it would be like if I did. Getting “ready” for work, having coworkers, Monday morning meetings, etc. sounds beyond intriguing! I am so excited to be partnering with Express today to share my take on an appropriate wear to work look for the spring season! 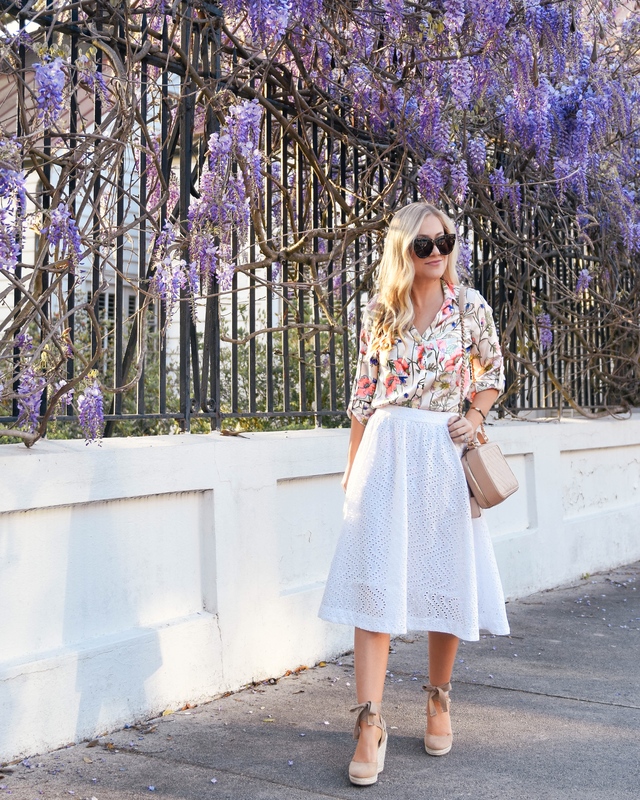 I’ve always loved midi skirts, and in fact, my first one I ever purchased was from Express! Express has always carried a great assortment of midi skirts in various colors and styles that are hard to find elsewhere. This white eyelet version is beautiful for so many occasions this season from the office to bridal celebrations (I also love this one!). I paired it with this floral blouse that would look great styled with jeans for the weekend. I loved the vibrant flowers on it and wound up blending in with all the blooms in Charleston! Work environments are incredibly diverse these days, but if your office place is more formal or you enjoy feminine looks like me, this outfit would be perfect! I’ve also shared a few more ideas for you at the end of the post. Lastly, I have a special discount code for you to use in-store to receive $25 off $100 with the ring code: 3387. For more details on the in-store promo code click here! *A special thank you to Express for sponsoring this post! All thoughts and opinions are my own. Beautiful pictures!! Love the blouse!